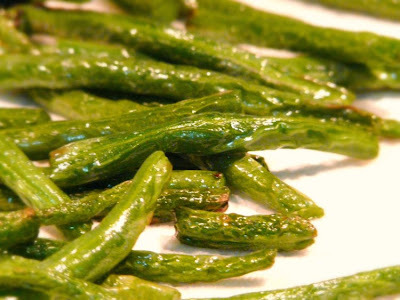 Stir fried green beans are, hands down, one of my favorite dishes to order at a Chinese restaurant. If it's on the menu, it'll be on my tab. However, when I first tried to make them at home, my green beans didn't quite turn out the same. The green beans at the restaurant had a wrinkly exterior but a crunchy interior which was what I loved about them but no matter how hard I tried, I couldn't get my green beans to turn out the same way. My homemade version tasted pretty good too but they just didn't have the same wrinkly texture. One day, I finally broke down and asked a waitress at a Chinese restaurant how their green beans achieved the wrinkly effect and she simply replied, "You fry them first." Doh, how could I not have guessed that? Yes, granted this isn't the healthiest veggie stir fry out there but it's certainly one of the tastiest. The trick is to fry the green beans over medium high heat for a few minutes until their skins start to wrinkle. Remove and drain them on paper towels then quickly stir fry them as you normally would. Because they've been pre-fried, they don't need to be cooked much longer beyond a quick saute with the other ingredients. Any longer and they'll lose their crunch. Makes one big platter of green bean heaven. Trim the ends off the green beans and wash them well. Because you'll be frying them first, you'll want to drain and dry them as much as possible to avoid oil splatter. If you have a splatter guard, you should probably get it out. Cut the green beans into roughly 3 inch pieces or longer if you prefer. I left some of mine in whole pieces because really long pieces of green beans float my boat. Heat the vegetable oil in a wok and fry the green beans in several batches for about 2 minutes over medium high heat. Don't fry them all at once because your wok will get overloaded and the green beans will just end up being soggy and greasy. 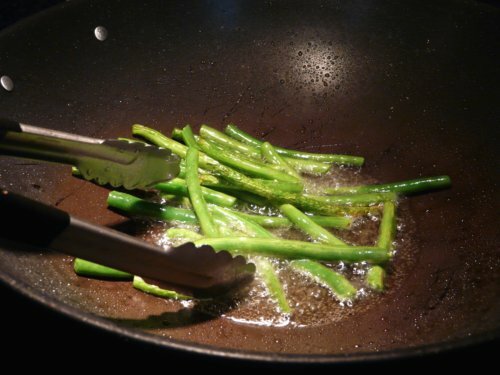 Using some tongs or cooking chopsticks, stir the green beans around quickly during this process so that they don't burn. I ended up burning a batch of my green beans because this is what happens when you have rowdy kids in the house distracting you while you're trying to cook dinner. Once the green beans have gotten wrinkly, remove from the wok and drain them on some paper towels. Set aside. Reserve one tablespoon of the remaining oil in the work and discard the rest. Saute the garlic and chili together for a minute then add the diced tofu. 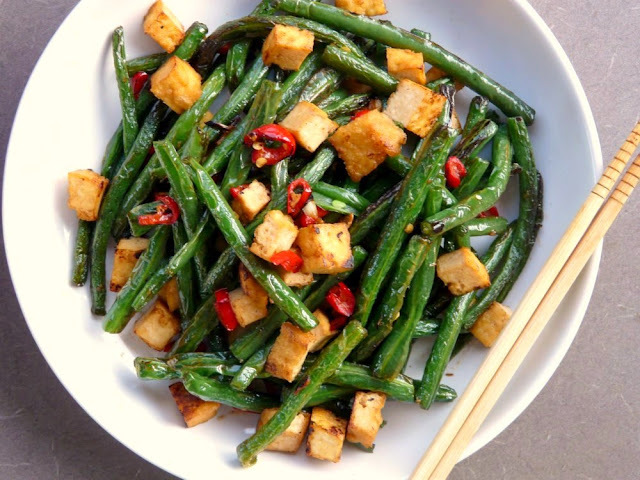 When the tofu has browned a little, add the green beans back to the wok. Add the sugar and soy sauce and stir fry for just another minute. Transfer to a dish and serve immediately. 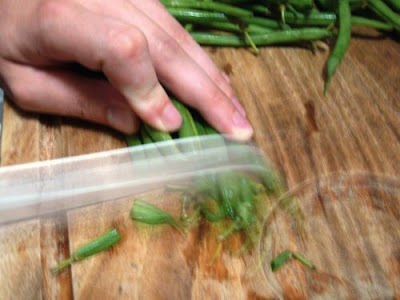 Trimming the ends off the green beans. Remember not to overload the wok! A big platter of green bean goodness! Wow! This recipe is very wonderful! I'm really looking for a healthy dish like this that I can cook for my breakfast next week. 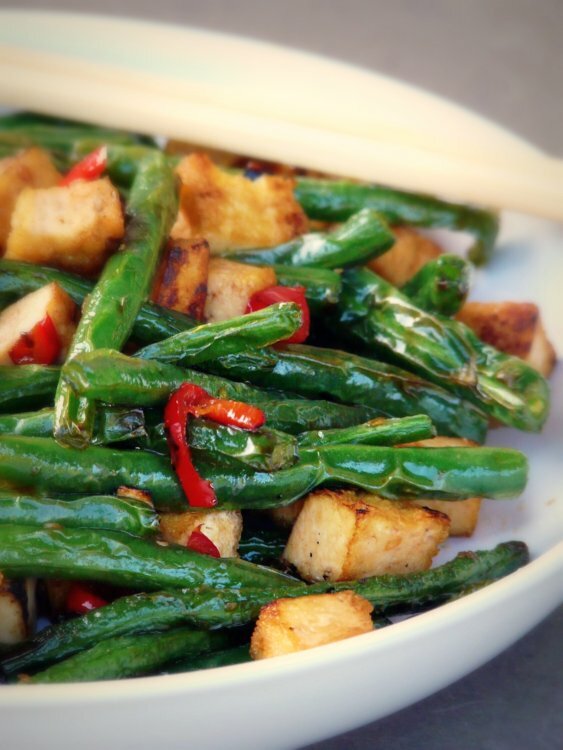 And I think this recipe is suited to my taste, because I really love eating green beans and tofu! I will definitely try this.